Green Jade beaded necklace features a handcrafted Black Rhodium plated hammered Bronze heart and a 24K Gold plated Bronze floating heart. 24K Gold plated Bronze toggle closure. Necklace measures 100 cm (39.4 in). 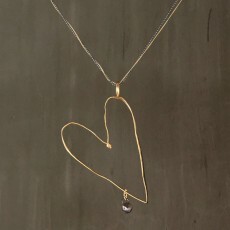 ..
A minimal piece, the floating heart pendant is handcrafted with hammered 24K Gold plated Bronze and detailed with a Black Rhodium plated Bronze bead. 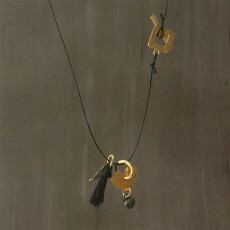 Suspended from a double two-tone 925 Sterling Silver chain, with 24K Gold plated and Black Rhodium plated finish. Chains Length: 80 cm (31.5 in).. 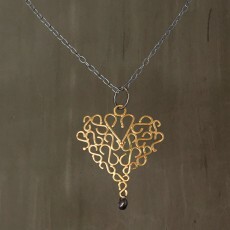 The Sweetheart pendant features a filigree design handcrafted with 24K Gold plated Bronze. Detailed with a Black Rhodium plated Bronze bead. Black Rhodium plated 925 Sterling Silver chain 80 cm (31.5 in) Pendant: 5 cm (2 in) x 5 cm (2 in) ..
Two-tone necklace features two tiers of graduated hoops handcrafted with 24K Gold plated hammered Bronze. Connected to a 925 Sterling Silver heart with Black Rhodium plated finish. 925 Sterling Silver link chain with Black Rhodium plated finish 80 cm (31.5 in) Full Length Pendant Drop: 1..
Heart and Crown pendant necklace features a 925 Sterling Silver heart with a Black Rhodium plated finish. Topped with a small 24K Gold plated bronze crown and detailed with a bead. 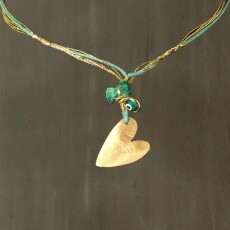 Pendant hangs from a 24K gold plated 925 Sterling Silver chain which measures 80 cm (31.5 in). 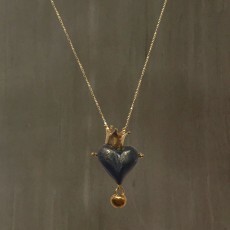 Heart 2 cm x 1.8 ..
Heart and Crown pendant necklace from my Fairy Tale Collection. Features a 925 Sterling Silver heart with a Black Rhodium plated finish, topped with a small 24K Gold plated bronze crown and detailed with a gold bead. 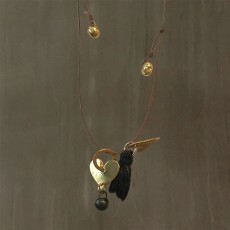 Black suede leather cord with adjustable tie closure allows the flexibility to ..
Small hammered Bronze heart with a 24K Gold plated finish and a Black silk tassel hang from a thin Black waxed cord which secures with a 24K Gold plated bronze toggle closure. 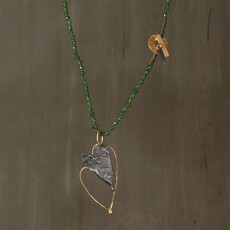 Detailed with a black bronze bead and the Aleema signature heart tag. A lightweight and easy to wear necklace. 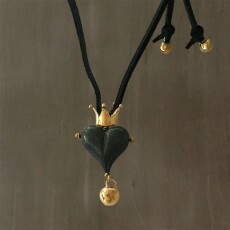 ..
Small heart handcrafted with hammered bronze and finished with 24K Gold plating, connected to a gold ring and detailed with a black bronze bead. 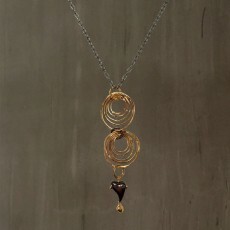 Paired with a Black silk tassel, and detailed with the Aleema signature heart tag. They hang from a thin Brown waxed sliding cord which adjust..